For grading and excavation contractors and clients who need cut and fill volume quantity information, is an earthwork program that provides a solution for traditional cross section project work. AEC CutFill is a powerful and flexible earthwork cut and fill calculation software program. AEC CutFill can be used to determine volumetric quantities by the Average End Area Method. AEC CutFill calculates quantities for nearly any earthwork application, including roadways, runways, ditches, borrow pits, site preparation, building excavations, parking lots, retaining walls, mining applications, land developments, and more. 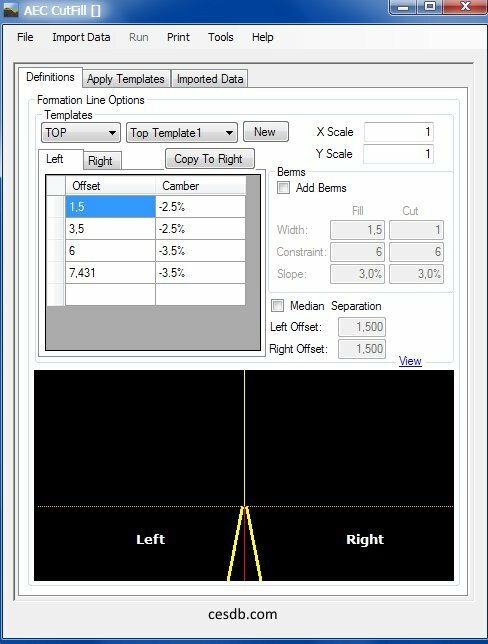 AEC CutFill takes your cross-section data for both existing and proposed ground levels and calculates the volume of earth to be removed and added. 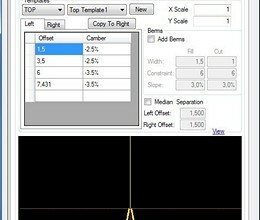 Cross sections are plotted and profiles are plotted in DXF File format and station and total quantities are calculated. * AEC CutFill download link provides trial version of the software. AEC Buildings is a project quantity estimation and 3d drawing tool to quickly prepare your designs, drawings, dimensioning and quantity estimation. AEC Terrain is designed to simplify terrain management and 3D-modeling. AEC 3D Rebar, is the same functionality as that of a structural engineer, a draftsman, a detailer and an estimating engineer working all together from concept to completion of design, detailing and drawing. Geotechnical Volume-Mass Calculator provides the user the ability to calculate all of the basic volume-mass (VM) properties when three VM properties are known and to graph the VM relationships of the soil. AEC CutFill has been rated 5.0 out of 5 points. A total of 1 votes cast and 0 users reviewed the software.